Every crew of the engine duty guard must know each other's duties, in addition to what knowledge on a ship. 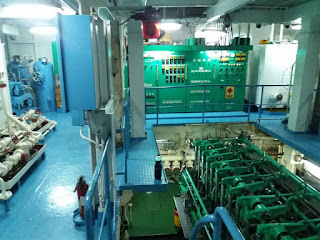 - Duty in the engine room at the time the ship is sailing and at the harbor. - Maintenance of pumps and equipment. - Fire pump test, engine lifeboat, lifeboat. - Carry out the tasks assigned by the captain or chief engineer. - Maintenance and records in accordance with company requirements and produces. - Room safety machine protection. - Maintenance and care electric motors. - Maintenance and care electric switchboard and panel. - Maintenance and care alarm. - Maintenance and care moving equipment, hydraulic and electricity from deck and machine parts. - Electrical parts and supplies. - Maintenance and care electrical accommodation equipment. - Maintenance and care of electrical equipment and workshop. - Emergency generator tests, batteries for lifeboats and radio stations. - Another task assigned by the captain or chief engineer. Sharing knowledge of seaman/seafarer work at ship. 0 Response to "Job Description Responsibilities 4TH Engineer & Electrician On Ship"